Honestly, I hate myself for taking so long to buy myself a copy of this book. Once I finally did, I then let it sit on my shelf for how many weeks before I even picked it up. So why did I do just that, you may ask? 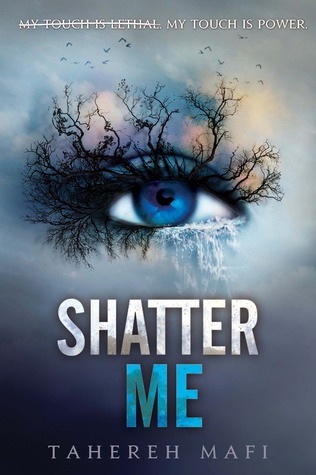 Simple.. Bloggers have been positively raving about Shatter Me since I started blogging (that was six months ago!) and it had somehow become engrained in my brain that books that are hyped aren't good. Crazy analogy, huh? (This is the reason why it took me forever to pick up The Unbecoming of Mara Dyer as well.) Too hyped - it can't possibly live up to the hype!, I couldn't help but think. And if it's not adamantly obvious by the very first statement of this review, Shatter Me lived up to the hype surrounding it. In fact, I'm going to go one step further and state no-holds-barred that this novel blew me away. First and foremost, I loved how Mafi didn't try to make her dystopian world so utterly complicated. Plenty of authors make that mistake - they suddenly throw out all of these names and terms that make no sense to first-time readers on the first few pages - no background whatsover, I might add - and they don't realize that most often than not, they lose these readers due to the fact that their worlds are too perplexing to grasp. I love how this world portrayed in Shatter Me is so simple, yet Mafi made sure that we had enough background to know just why the world we live in came to be the world she built. I found it easy to lose myself in this particular fabricated world - every single detail about it was absorbing, and I honestly couldn't read about it enough. I loved the writing. I loved how unconventional it was, and it fit Juliette's personality to a T. I know that some people found it to be a bit too exaggerated, but that wasn't the case to me. It perfectly showcased Juliette's loneliness, desperation, and self-hatred. Labelled a murderer because of her fatal touch, Juliette is deemed too dangerous to be amongst other people, and she was thrown into isolation. Via the writing, you see how 264 days in isolation affected her - she had no one to talk to but herself all those days, and Juliette merely had a pen and notebook to keep herself company. Furthermore, we were also privy to the difference between how Juliette herself wants to think, and how she was taught to think by those around her. As a matter of fact, in my opinion, Juliette is a step or two away from complete and total insanity, all because of what she went through in life. After such a long time living in her cell by herself, Juliette is thrown into a loop when she is suddenly joined by another prisoner by the name of Adam. I think it couldn't be more obvious that a relationship, a connection, would develop between Juliette and Adam. What else could you expect between two people locked together in confinement? What I was interested in was how Mafi would write about this said relationship - how exactly would she develop it? I'm not going to lie - I was expecting insta-love, but that couldn't be further from how Mafi portrayed Juliette and Adam's budding relationship. A lot more things are at play between the two. Well, sure, there is a bit of insta-love from Juliette's side of things, but hey, can you blame her? How long has she been without another person beside her? However, just because Juliette is attracted to Adam, that doesn't change the fact that she's almost forgotten how to act around another person, and that she is wary of other people, simply put. Their initial interactions were minimal at best. That of course changes as time goes by, but you get my drift. I appreciate that Mafi's writing was true to Juliette's character and background through and through. Okay - this review would be in no way complete if I don't talk about Warner. Warner, Warner, Warner. Pretty much all my friends who have read Shatter Me are gaga over Warner and want him to end up with Juliette, but I really can't say the same. It's not that Warner isn't an intriguing and fascinating character (because he IS, and I want to learn everything I can learn about him), but I just don't think he's a good match for Juliette.Warner is TOO infatuated with Juliette, and this infatuation seemingly stemmed from merely his admiration of her power, and I do not like that (of course, I could be wrong, given that I haven't read the sequel). He's practically obsessed! Besides, Juliette is (for the lack of a better word) broken. In my opinion, a guy like Warner - power-hungry, domineering, sly and dangerous, amongst others - can't possibly help Juliette love herself more in the long run. All in all, I LOVED this novel. (And I just love Tahereh!) I can't wait to see how Juliette will continue to grow as a character, and I'm positively excited to know more about both Adam and Warner. I don't usually like dystopia, but this one sets itself apart from other books from its genre. I'm definitely following this series to the end! A lot of people keep saying that I will be all for Warner once I read Destroy Me and Shatter Me, and honestly, that's one of the reasons why I cannot make myself pick them up. I just love Adam too much! love love love the review!!! Read Destroy Me and Unravel me!!! Thank you! :) And yes, I really can't get enough of Tahereh's writing. Don't worry, I'll go on to read Unravel Me soon! I've heard ppl saying bad things about this book. This review makes me want to read it myself, thank you! Gotta catch it later soon! I'm not a fan of dystopian books either, but I'm willing to be open minded. I'll have to check this one out.